Prior to the release of the Adobe Creative Suite CS6 there were several Photoshop color extensions available from third party developers such as ColoRotate, Ozone, Color MegaMix, Absolute Color, and more. 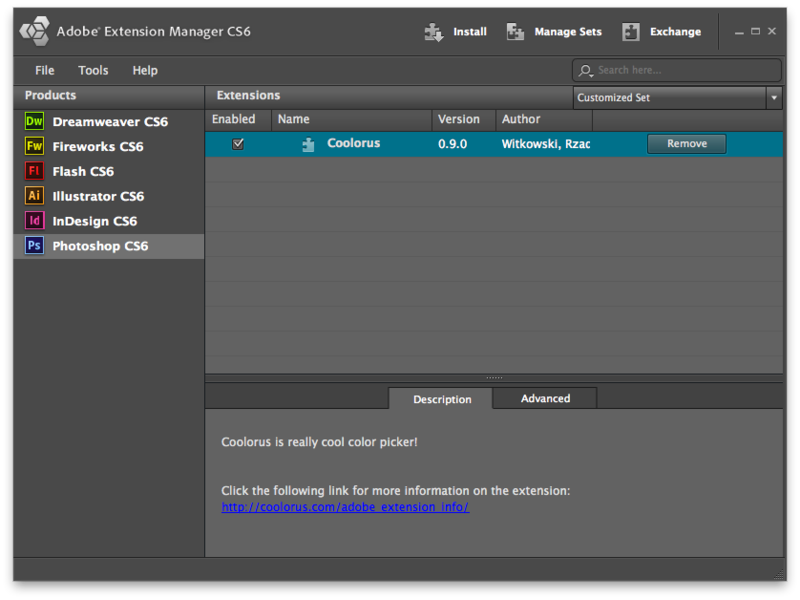 Even though CS6 has been out since May 2012, the options for low cost plug in color extensions are extremely limited. Here is one that is currently commercially available, one that is under development and one that Adobe provides as part of the CS6 suite. 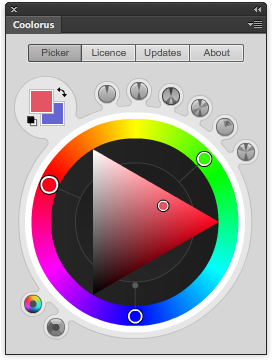 Coolorus is a CS6 compatible plug in color wheel panel for Photoshop and Flash now available in a limited time trial version. Once downloaded and installed it can be found under (window > extensions). It can then join other panels in the workspace. 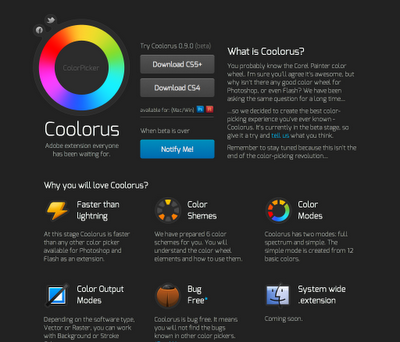 According to the developers, the Coolorus color wheel extension offers quick color selection with basic segmented and full spectrum color modes. The basic mode is divided into 12 basic colors. Coolorus also includes a variety of color schemes including mono, complementary, triadic, tetradic, and analogic. The color picker easily reverts from background to foreground color selection. 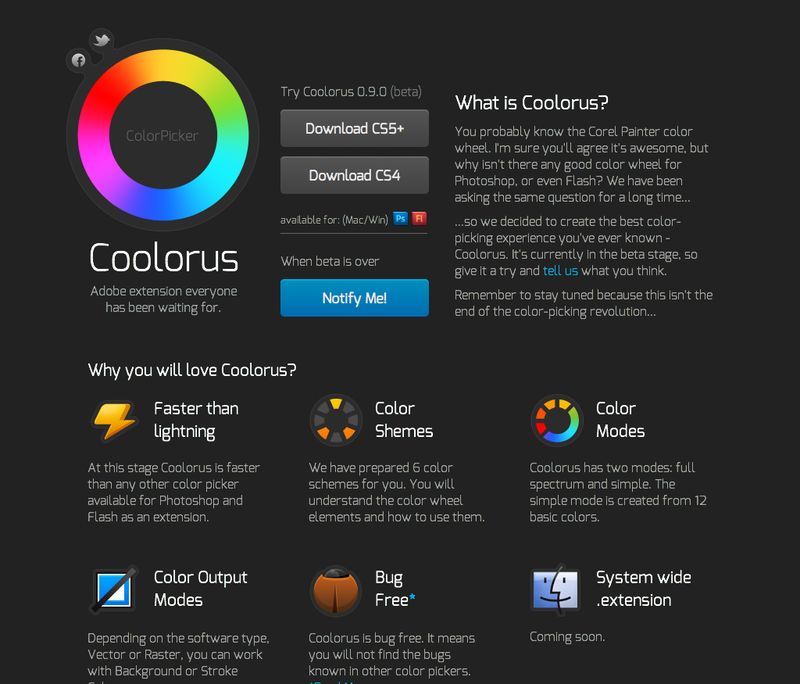 Coolorus is somewhat similar to the color picker available in Corel Painter. Coolorus full spectrum color ring mode. Coolorus website home page. Play with the color ring at the top left for a surprise. Adobe Kuler is a color extension already resident in the Adobe Creative Suite CS6 that allows the user to create a coordinated color theme or adopt one from a large community of Kuler color theme contributors. 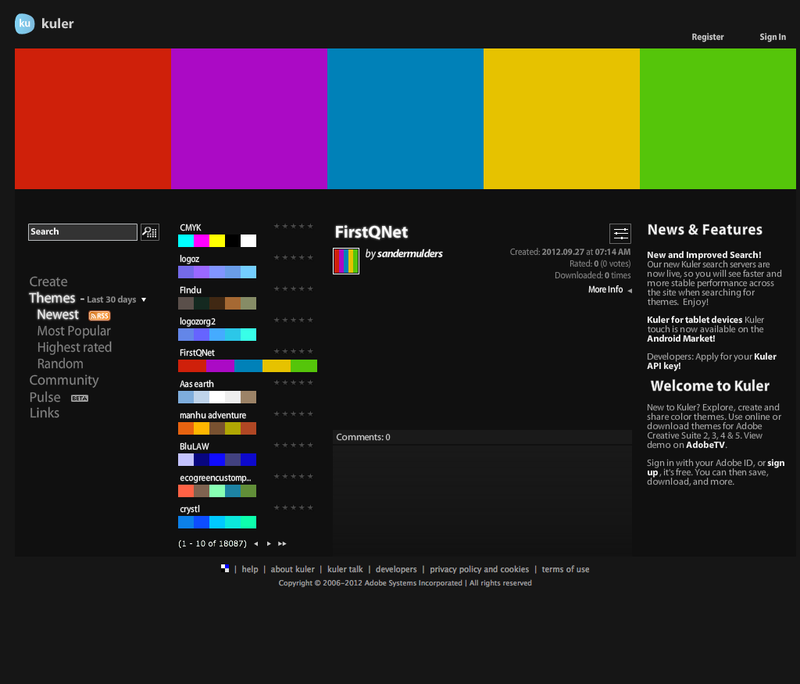 Users can choose and modify existing color schemes. Kuler color schemes consist of no more than five colors. There are over one half million color themes available at any given time. Users can search for themes with by using descriptive statements, like “Autumn Leaves”. Browse by newest, most popular, and other options, or search by tag, title, creator, or hex value. In color picker mode, Kuler offers options to create themes by analogous, monochromatic, triad, complementary, compound, shades, and custom selection rules. Adobe Kuler in color theme selector mode. results for a search for "Autumn Leaves". Kuler color picker mode using the Compound option. Kuler selection rule options in the color picker mode. A color panel and color wheel Photoshop CS6 plug designed specifically for digital painters, matte painters, video effects artists, and comic artists. 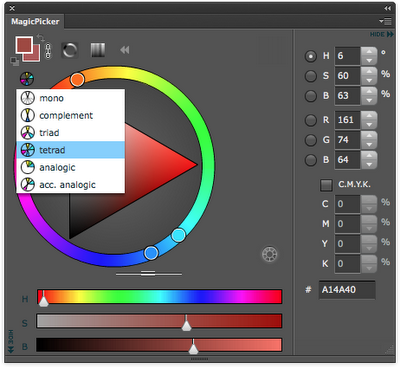 MagicPicker provides two color selection modes and six color schemes that are mono, complement, triad, tetrad, analogic, and accented analogic. 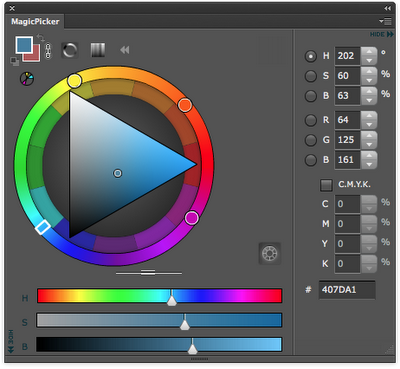 Magic Picker combines both a Photoshop type panel based interface window, and a color wheel formatted color picker, making it a very versatile extension. MagicPicker provides the option to choose colors not just visually, but also numerically. 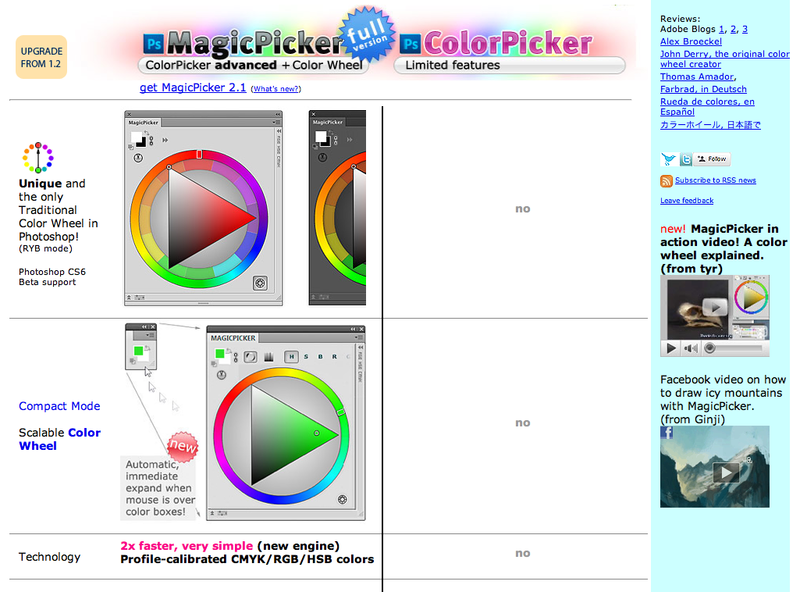 MagicPicker was formerly marketed as ColorPicker®. 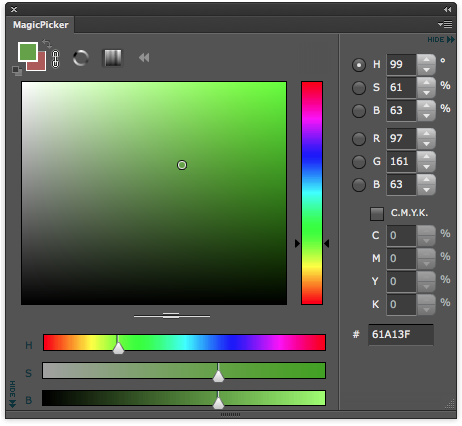 MagicPicker panel color selection mode. MagicPicker selection window with color scheme options. 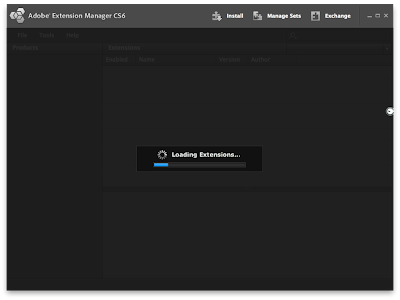 The Adobe Extension Manager is used to install and manage extensions for Adobe software products including Bridge, Contribute, Dreamweaver, Fireworks, Flash, Illustrator, InCopy, InDesign, Photoshop and Premiere Pro. All extensions installed through the Adobe Extension Manager must be installed using the ZXP or MXP file format. 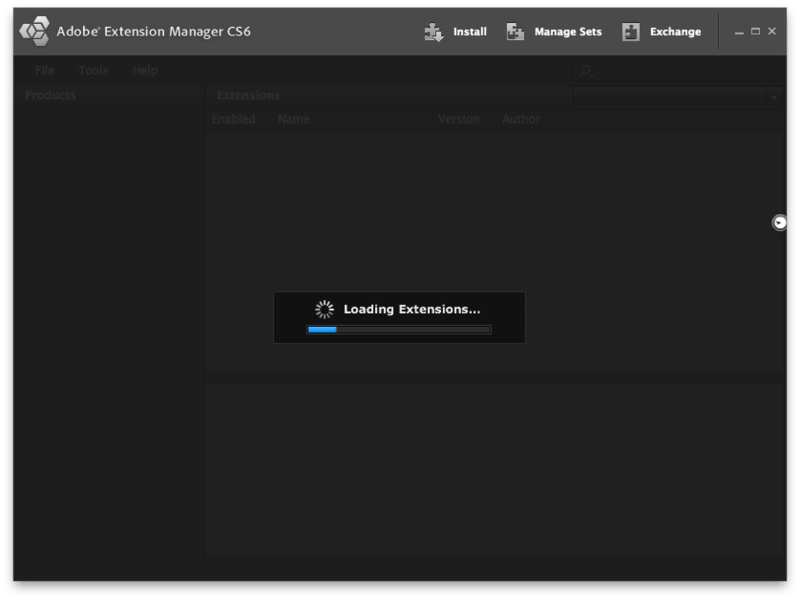 The extensions manager is a very quick way to install extensions into multiple software programs in the Adobe Creative Suites simultaneously. For example, if the extension is made for Photoshop, Illustrator, and Flash, it will be automatically be made available to all programs at the same time. Installed extensions can then be turned on and off through the extensions manager at the users discretion. extension by double clicking the extension's icon. is a stand alone app that can also be opened independently.